The first National Research Platform (NRP) Workshop is happening next month and The Quilt is excited and looking forward to discussing and learning more about our potential role in developing a national big data superhighway. The NRP workshop will be held at Montana State University in Bozeman, Montana on Aug. 7 and Aug. 8. The purpose is to bring together representatives from interested institutions to discuss implementation strategies for deployment of interoperable Science DMZs at a national scale. This workshop is sponsored by the National Science Foundation through the Pacific Research Platform and Montana State University, and CENIC. The National Science Foundation funded a 5-year cooperative agreement for the Pacific Research Platform (PRP) to improve the end-to-end, high-speed networking data transfer capabilities in collaborative, big-data science among 20 institutions. As part of the PRP cooperative agreement, NSF requires that the ensemble of PRP technologies be extensible across other scientific domains and to other regional and national networks. In response to this requirement, the NRP Workshop will solicit input from many multi-state networking organizations (Internet2, The Quilt, ESnet and others) on how the PRP model might further blossom. Sessions will be devoted to science-driver application researchers describing their needs for high-speed data transfer, including their successes and frustrations. Discussions will focus on requirements from the domain scientists and the networking architecture, policies, tools and security necessary to deploy a 200-institution National Research Platform. All participants will be encouraged to ask questions and share their thoughts during these discussions. View the impressive line-up of speakers and experts. The NRP is committed to facilitating the necessary social engineering among a diverse group of science, R&E network and IT leaders as well as provide proven end-to-end networking. An effective national partnership will need cyberinfrastructure experts working with scientists at their interface and understanding the desired scientific outcomes, rather than viewing the technology as an end to itself. Identifying common functionality that can be leveraged between science applications to make the NRP partnership more efficient and effective and prioritize high-performance access to supercomputer centers is key. Registration has closed as the event is at capacity. For information about future workshops or the latest PRP research, please join the PRP listserv. Any other questions, visit the FAQ section on the event website. 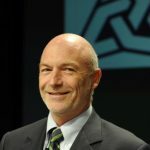 The Quilt, a national coalition of advanced U.S. regional networks for research and education (R&E), and MCNC, the non-profit owner and operator of the North Carolina Research and Education Network (NCREN), today announced that MCNC Chief Technology Strategist Mark Johnson will represent the national R&E networking community on a new Working Group within the Federal Communication Commission’s Broadband Deployment Advisory Committee (BDAC). In January, FCC Chairman Ajit Pai announced the formation of this new federal advisory committee that will provide advice and recommendations for the commission on how to accelerate the deployment of high-speed Internet access. The BDAC is intended to provide a means for stakeholders with interests in this area to exchange ideas and develop recommendations to enhance the FCC’s ability to carry out its responsibility to encourage broadband deployment to all Americans. The FCC announced two BDAC Working Groups this week, and Chairman Pai appointed Johnson to serve as a member of the Removing State and Local Regulatory Barriers Working Group, which is a 25-member group chaired by Robert DeBroux, Director of Public Policy and Federal Regulatory Affairs at TDS Telecom and full member of the Broadband Deployment Advisory Committee. The other BDAC Working Group announced this week will focus on Competitive Access to Broadband Infrastructure. Another two BDAC Working Groups were announced earlier this month. The full BDAC held its first public committee meeting on Friday, April 21. The schedule for the new BDAC Working Groups has yet to be determined. Johnson’s career encompasses 30 years of leadership experience in the management, engineering, and operations of Internet technologies. During his tenure at MCNC he has been responsible for operating a private microwave network and for a variety of fiber network technologies as a customer and constructor. North Carolina’s varied geography and mix of urban and rural communities means he has encountered all types of technical and regulatory obstacles in broadband technology deployment. And, Johnson has successfully worked with all types of entities in the broadband technology landscape to address these obstacles. He also is a founding board member of The Quilt, a former board chairman, and currently serves as its vice chair. 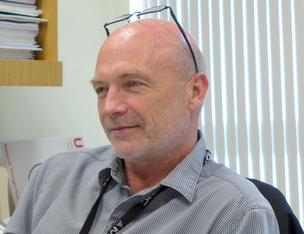 The Quilt has nominated MCNC Chief Technology Strategist Mark Johnson to serve on the Federal Communication Commission’s new Broadband Deployment Advisory Committee (BDAC) as a representative of the national research and education (R&E) networking community. In January, FCC Chairman Ajit Pai announced the formation of this new federal advisory committee that will provide advice and recommendations for the commission on how to accelerate the deployment of high-speed Internet access. The BDAC is intended to provide a means for stakeholders with interests in this area to exchange ideas and develop recommendations, which will in turn enhance the FCC’s ability to carry out its responsibility to encourage broadband deployment to all Americans. According to reports, approximately 380 nominations have been submitted for this committee with 17 seats available. The FCC intends to establish the BDAC for two years, with an expected starting date this spring. The role of R&E networks in delivering advanced broadband Internet access for education, research and other community anchor institutions while also working to evolve the technology of the Internet itself provides an important perspective for the committee as it contemplates how to remove barriers to deployment. The Quilt President and CEO Jen Leasure explained that because R&E networks like MCNC were established to meet the specialized needs of academic research in higher education institutions. The experience they have is particularly valuable for informing FCC policy for gigabit networks and beyond. MCNC is a technology nonprofit that builds, owns and operates the North Carolina Research and Education Network (NCREN). MCNC has deployed fiber in 82 of 100 North Carolina counties and serves anchor institutions in all 100 counties on this vast, 2,600-mile network. MCNC also is committed to creating a market for dark fiber in the state to facilitate ubiquitous, gigabit residential broadband. Johnson’s career encompasses 30 years of leadership experience in the management, engineering, and operations of Internet technologies. During his tenure at MCNC he has been responsible for operating a private microwave network and for a variety of fiber network technologies as a customer and constructor. North Carolina’s varied geography and mix of urban and rural communities means he has encountered all types of technical and regulatory obstacles in broadband technology deployment. And, Johnson has successfully worked with all types of entities in the broadband technology landscape to address these obstacles. Johnson has received support from The Quilt as well as from many members of The Quilt who have written letters of recommendation. Internet2 has submitted a letter on his behalf and well as the North Carolina Wireless Research Center. N.C. Secretary of Commerce Tony Copeland has endorsed his nomination as well as Internet pioneer Jane Patterson and Joanne Hovis from the Coalition for Local Internet Choice (CLIC). Mark is a founding board member of The Quilt, is a former board chairman, currently serving as its vice chair. Mark is also a founding board member of the Schools, Health, and Libraries Broadband (SHLB) Coalition, a nonprofit, advocacy organization that supports open, affordable, high-capacity broadband connections for anchor institutions and their surrounding communities. If selected, he will represent the interests and missions of The Quilt research and education network community as a whole and is willing and available to serve a two-year term on the committee as well as participate as a member of any subcommittee(s). The Quilt returned to La Jolla, Calif. on Feb. 7-9 for its Winter Member meeting. We have captured and curated many of the social conversations captured during the annual event. Please enjoy! The Quilt will be returning to the La Jolla Shores Hotel and La Jolla Beach and Tennis Club in California on Feb. 7-9 for its Winter Member meeting. Among the many exciting conversations and topics of interest that week will be the ESnet Science Engagement Workshop for Regional Networks on Thursday, Feb. 9 (9 a.m. to 3 p.m.) inside the La Jolla Room at the La Jolla Shores Hotel (separate registration required). The Energy Sciences Network (ESnet) provides network connectivity and services for DoE/SC Labs to communicate with science collaborators around the world. To support this mission, ESnet conducts regular reviews of network requirements to determine the current and future science communication and collaboration needs for numerous communities. The purpose of these reviews is to accurately characterize the near-term, medium-term and long-term network requirements of the science being performed. This approach brings about a network-centric understanding of the science process used by the researchers and scientists, without asking technical questions directly, and derives network requirements from that understanding. The goal of this interactive workshop outlines a process that can be adopted by members of the R&E networking community to advance the mission of science engagement and fully realize the investments made in networking and personnel by agencies such as the U.S. Department of Energy Office of Science and the National Science Foundation. The topics of this workshop focus on the intersection of research and technology, in particular the use of high-speed networks. Specifically, the purpose of science engagement; overview of an outline for a case study approach to gather scientific requirements (documentation, meeting preparation); and a live example of how to conduct an in-person review to characterize needs with a visiting scientific group. View the Draft Agenda. Regular participants in The Quilt and the cyberinfrastructure engineering community are encouraged to attend, participate, and help define a strategy to encourage growth of scientific understanding and support. Limited space is available. Please contact Jennifer Griffin if you have any additional questions! 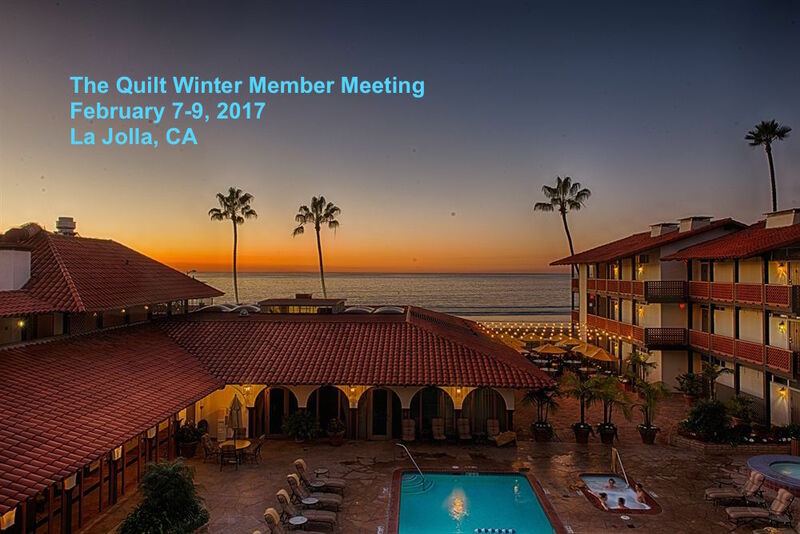 The Quilt will be returning to the La Jolla Shores Hotel and La Jolla Beach and Tennis Club in California on Feb. 7-9 for its 2017 Winter Member Meeting. If you have not yet registered, online registration is available. Click here. Two hotel choices are offered – The La Jolla Shores Hotel and The La Jolla Beach and Tennis Club. These properties are adjoining properties and are a short walk between one another. The main Quilt Member Program will be held in the La Sala room at the La Jolla Beach and Tennis Club. We are looking forward to the many exciting conversations and topics of interest this year. View the agenda. We also have provided time between sessions for working lunch meetings and other networking opportunities. During the Quilt Fall Member Meeting a couple of independent conversations happened around getting a few working groups in the same room since we all have a stake in each other’s best practices. We have scheduled that opportunity on Thursday, Feb. 9 from 8 a.m. to noon. Three of The Quilt’s working groups: Financial Focus Group, Communications and Outreach, and Services, will be coming together to discuss areas of common and interdependent interest and tap into the wider group experience and expertise. This is an opportunity for members of these working groups and other Quilt member staff to exchange experiences and ideas on process, strategies, financial exercises, and key decision making approaches that can ultimately be developed and replicated within The Quilt R&E networking community. Participants are encouraged to participate and help define a strategy that can be used to leverage programs and services across our community. Joe Sawasky, President and CEO of Merit Network, also will be presenting on the Merit Digital Collaboration Tool: Merit Commons. Please contact Jennifer Griffin if you have any questions at this year’s Winter Member Meeting. Follow all conversations on social media using #WMM17. Every November, thousands of researchers and industry representatives in high-performance computing and related fields, such as advanced networking, data storage, and data analysis, meet for the annual Supercomputing Conference (SC16) to learn about HPC and scientific applications and innovations from around the world. This year’s conference, with the theme “HPC Matters,” took place Nov. 13-18 in Salt Lake City, Utah. This annual event previously was held in Salt Lake City in 2012. Quilt Members once again were an integral part of the annual event through demonstrations, booths, presentations and building SCinet. Quilt members joined many from the international supercomputing community, essentially a gathering of scientists, engineers, researchers, educators, programmers, system administrators and developers that is unequaled in the world. The internationally-recognized technical program included presentations, papers, informative tutorials, timely research posters and Birds-of-a-Feather sessions. A 515,000 square-foot exhibition hall featured the latest technologies and accomplishments from the world’s leading vendors, research organizations and universities, offering the first opportunity for attendees to learn about the technologies that will shape the future of large-scale technical computing and data-driven science. The Salt Palace Convention Center during the event also turned into the home to the fastest, most innovative computer network in the world during SC16 conference. SCinet, the high-performance, experimental network built specifically for the conference, offers an unprecedented amount of bandwidth within the conference exhibit hall and connecting the convention center to the broader Internet. Partnering with Quilt Member Utah Education Network (UEN) and CenturyLink, SCinet provided more than 5 Tbps of internal network bandwidth, along with tens of 100 Gbps Ethernet circuits to bring 3.15 Tbps of Wide Area Network bandwidth to the convention center. UEN guided this collaboration with national and international research and education networks and commodity Internet providers. More than 12,000 conference exhibitors and attendees relied on SCinet during SC16. Listen to the UEN podcast on how Corby Schmitz and Gyongyi Horvath prepare for SC16. If you or others from Quilt Member Institutions attended SC16, we would like to hear from you and your experience for a future blog. Please contact us or Tweet us @TweetTheQuilt. The Quilt, NSF’s Campus Cyberinfrastructure & Cybersecurity Innovation for Cyberinfrastructure PI Workshop, and ESnet Site Coordinators Committee co-located meetings again this year during our Quilt Fall Member Meeting on Oct. 19-21 in Philadelphia. We’ve curated the meeting’s conversations for you that were captured on Twitter.